Crude oil tanker. 63,292 grt; 119,378 dwt. Owners: NV Curaçaosche Scheepvaart Maatschappij, Willemstad, Netherlands Antilles. Managers: Shell Tankers NV, Rotterdam. Built: 1966 by IHI – Ishikawajima-Harima Heavy Industries Co Ltd, Aioi, Japan. Yard no 650. Main engine: nine-cylinder IHI-Sulzer 9RD90 of 18,252 bhp at 119 rpm. Speed: 14.5 knots. 1994-to breakers at Chittagong, Bangladesh 28/3. Shell's DARINA was also thus fitted. Shell produced a super film entitled "From MUREX to DARINA" which looked at the lightening process in detail. 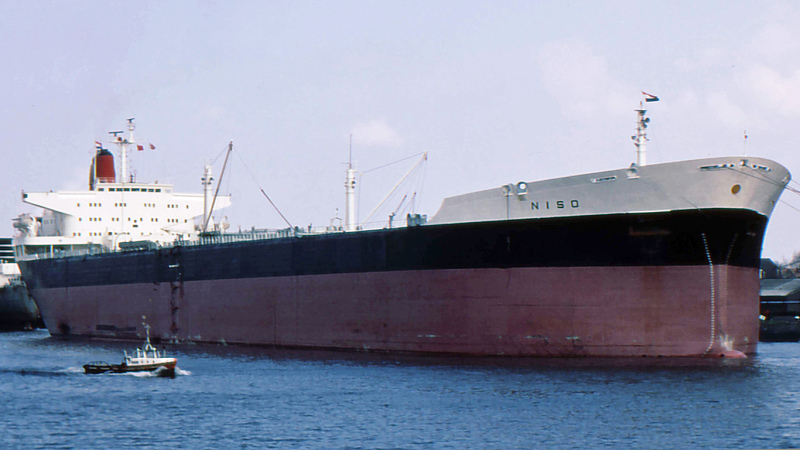 And, of course, the smaller HALIA worked as a lightening tanker. I seem to recall that NATICINA was similarly retrofitted. This one brings back lots of memories, Bob. A regular visitor to Shellhaven in the 1970s and seen countless times in the Thames Estuary from distance - but no photo.